After accidentally deleting all my notes and getting really frustrated, I finally completed part 2 of my personal favorite games of the 7th Console Generation, the first of which you can read here. Sparing the need for a lengthy introduction, let’s get right to it. Okami holds the dubious honor of being the worst-selling recipient of a “Game of the Year” accolade from a major gaming publication. Which is pitiful, because Okami is a wonderful and uplifting adventure of mythical scope and legendary beauty. Thick outlines, wispy details, and a rich palette lend the game a painterly aesthetic inspired by traditional sumi-e watercolor painting. The vast world of Nippon provides an incredible possibility space for any number of adventures, each quest draws players into a fairytale world where friendly deities inhabit everyday life, helping humans with their everyday problems and protecting them from nasty demons like Blight, Ninetales, and Crimson Helm. Okami isn’t a dark, serious, conflict between forces of good and evil, but rather a playful, childlike one, with animals to feed, forests to regrow, and bridges to repair. 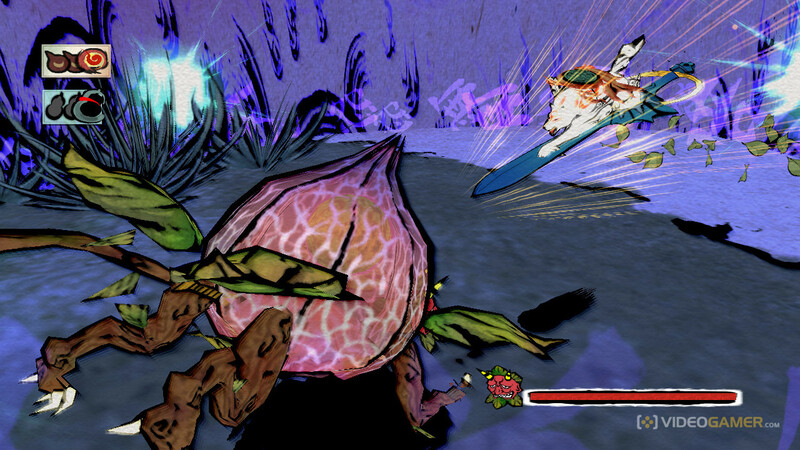 Okami was special because it imbued action-adventure mechanics with positivity and love. An innovative core mechanic provides players with a thematically assonant means to interact with the delightful world. Using the Celestial Brush, controlled with the Wii Remote, players can paint objects into existence: a swish of the brush produces a strong gust, while a circle in the sky produces bright sunlight. Using a collection of brush techniques, players enact positive change upon the world. Carrying a positive subtext about environmental preservation and restoration, Okami‘s methods of interaction revolve around construction and restoration, rather than killing and destruction, making it ultimately way more unique as an action-adventure game than it should be. Enemies don’t fall over and die, but burst into beautiful clouds of flowers and butterflies, suggesting that the act of killing a creature is an action of liberation and restoration, rather than strictly one of violence. This all culminates to create a sense of mythic wonder characteristic of the very best of adventures. Bastion is a textbook example of how to design a linear game of progression properly. An isometric hack-‘n-slash game, Bastion delivers its story in a unique way, a reactive narrator, Rucks, voiced by the cool, wistful, Logan Cunningham, comments on every action the player takes, delivering a constant stream of exposition that lends the narrative a detached, forlorn feel. In Bastion, the player wakes up to find his home world of Cylondia destroyed by some cataclysm of unknown origin, known only as the Calamity. He meets Rucks, and the two work together to collect crystals to restore power to the Bastion, a floating ship that would either allow them to set sail away from post-apocalytpic Cylondia or send them back through time to Cylondia before the Cataclysm. Bastion was special because it was aesthetically luscious and perfectly paced. Metaphorically, Bastion is an allegory about failed relationships. Players can choose to accept that great loss and move on, hoping to come across new friends, memories, and love somewhere in a terrifyingly vast future. Or they may choose to cling on to the possibility of reliving those moments of joy and returning to peaceful life prior to the Calamity, all while living in the shadow of the possibility that the Calamity would happen again. Its an emotive story with impactful, real-world implications. Outside of its luscious, painterly aesthetic, its twangy, evocative soundtrack, and its original narrative, Bastion is perfectly paced and filled with variety. Every weapon the player acquires fundamentally changes how the game works. Different pieces of equipment don’t alter the numbers soft coded into the game’s combat system, but introduce systemic changes that substantially alter kinesthetics, tactics, and combat encounters. Playing Bastion with a machete and a bow is fundamentally different from playing Bastion with a shotgun and mortar, creating such an incredible degree of dynamism that players could have radically different experiences playing through the same story. Gravity isn’t our friend in video games, its shadow creeps behind our every move in space like an overbearing schoolteacher, eagerly seeking out the slightest fault. Hungrily it waits, waiting for the opportunity to end our fun, bringing us careening down into the lava pit, the bottomless abyss, the steel bed of spikes. Jumping may grant us temporary liberation from its heavy grip, but down we fall, unable to escape its gloomy grasp. No matter how joyful and free we may believe ourselves to be, Gravity’s inescapable shadow paces restlessly, watching us, reminding us that we are mortal, and that our fun comes at a risk. Super Mario Galaxy was special because it recreated gaming’s oldest adversary as a playful friend. Which is why Super Mario Galaxy is perhaps the greatest 3D platformer of this generation. Here, gravity is not judge nor adversary, but friend, playfully inviting us to dance. Levels in Super Mario Galaxy are comprised of numerous objects in space, each with its own gravity field. Gravity in Galaxy becomes a toy to be played with, and players joyfully dance through planetoid, starfield, and asteroid as they experiment with the boundaries of this otherworldly conception of physics. Suddenly, movement through virtual space, an experience that we’ve long since become accustomed to that it has become rote, becomes fresh, joyful, liberating. The cathartic escape of spinning into that first launch star and rocketing myself away from my preconceptions about physics is a feeling that I will never forget. Most AAA action-games ask players to enact power-fantasies, granting players a plethora of skills, powers, weapons, and tools, and giving them a stream of opponents and challenges to unleash them upon. Skillful play in games like Batman and Vanquish is empowering, the aggressive thrill of terrorizing violent thugs and evil robots intoxicating. This power fantasy has become so deeply encoded into video games that it has become the unsurprising norm. In direct contrast is The Last of Us, Naughty Dog’s post apocalyptic survival-horror myth, where combat is explicitly disempowering. A hybrid of mechanics lifted from third-person shooters and stealth games, every combat encounter in The Last of Us overwhelms players with a tapestry of emotions, fear, panic, and catharsis. Interspersed between battles are long swaths of scavenging and exploration through believably designed environments, all performed in the creeping shadow of the possibility of ambush. Little glimmers of hope pierce the bleakness, often in the form of small portions of essential resources: half a bottle of alcohol, a broken pair of scissors, a cup of sugar. But desperately they may scavenge, players are never quite adequately prepared for any given encounter. Enemies are typically overwhelmingly strong, and almost always greatly outnumber Ellie and Joel. Their smart, hunter-ly behavior pigeonholes players into moving conservatively around the environment, the dreadfully tense dance between covers crescendoes into a panicked ratchet of gunfire and shivs, climaxing with the cathartic release of killing that last thug or Clicker. And then, the grisly and nauseating aftermath, the sigh of relief transitions back into anxiety, and the heavy shadow of desperation creeps on. The Last of Us was special because its mechanics textured its powerful narrative elegantly. And that’s to speak only of the game’s mechanics. The Last of Us remyths the archetypical “zombie” narrative in one of of the most engaging stories of that kind in recent memory, exploring themes about the demarcation of social boundaries of what entails “us” and “them” and what constitutes people as being “the other”. Restrained, tasteful cinematography and animation communicates unspoken, repressed, emotions, Ellie and Joel’s character development is represented cinematically with nuanced grace. The game’s incredible ending meditates on the moral intricacies of Christianity’s central narrative, arriving at an uneasy conclusion about interdependency and need. The Last of Us‘s mechanics, intricately designed to be assonant with the world and narrative, create a cohesive whole that is indubitably one of the best games of the year. Portal 2 was special because it exemplified great puzzle-design. Representationally, Portal 2 is one of the more interesting advancements in environmental storytelling. The sterile hallways and elevators of the first Portal crack at the seams, giving way to lush vegetation and unspoken post apocalyptic ruin. The nostalgic design of Old Aperture conveys an authentic sense of style and place, communicating Cave Johnson’s character arc as he led Aperture through decades of decline. While the core narrative of trust, betrayal, and tenuous partnership has been done before in other games, Portal 2‘s genuinely funny writing and lovably sadistic characters allow it to transcend its cliches, turning it into one of the most original adventures of the last few years. As I climbed over that first dune in the desert, I saw the mountain towering before me, eclipsing the sun’s blinding glow. The sands stretched out infinitely, the murky haze of warm air obscured my vision, and I couldn’t perceive the crevasses, towers, and valleys that laid in the wide expanse of my future. I slid down the slope, walking towards the first shrine I saw, and found a glowing insignia floating before an altar. I touched it, and a red, glowing scarf materialized out of thin air and wrapped itself around my neck. I jumped off the shrine, and gently floated, weightless, liberated and free. The scarf granted me the power of limited flight. I smiled, and hopped my first steps towards the vast monolith in the horizon. As I walked, my vision of the mountain gradually became clearer and more distinct, and I knew that I was destined to ascend it. On my way, I met other people, also on their way towards whatever destination they were seeking. Some accompanied me, happily chirping as we hiked the desert sands, others looked away and hurried along the stony ridges. I met another cloaked traveler in the collapsed ruins of a city who decided to accompany me, a gleeful chirp and a dainty dance sealed our partnership. We ascended climbed the temple of our ancestors to arrive at a snow-covered slope. We were very close to the summit, the mountain’s peak visible behind a thin layer of clouds, and so we pushed on. As we climbed the snow-blanketed slopes, the wind began to blow. A thin layer of frost formed around my scarf and cracked away at it. We pushed on, and the wind blew angrily, pushing us backwards like an invisible force opposing us, and more of the scarf crumbled away. The wind matured into a blizzard, ice battered our bodies, freezing our cloaks. We drew close together, hoping the warmth of each other’s bodies would sustain the magic scarves until we reached the top, but gusts of snow would throw us apart. The stone dragons hungrily floated above us, waiting to strike at us in our weakness. We were tired, worn, and weary, and our strong stride slowed to a desperate crawl, each step more arduous than the last. The clouds above us congealed into a solid grey firmament, and the mountain’s peak faded away. I looked at my partner, and his head bobbed feebly as it if it was trying to make a sound, but only managed a weak moan, and crumbled into the snow, dead. Terrified, I tried to call back, but the flow of cold air into my lungs crushed me, and I collapsed onto the slope, I looked up, trying to make out the peak, but couldn’t, and died. And I was basked by a welcome glow and a pleasant warmth. I opened my eyes, and saw my ancestors standing before me. They pulled my broken body from the ice, and gave me a new magic scarf and stepped away from me. An electrifying chill of power pulsed through my body, and I leapt skyward, through the storm layer and past the stone dragons. I pierced the cloud layer and I arrived at the summit. The sky was clear, and the warm sun cast a gentle glow upon the heavenly cloth bridges and red gates. I playfully danced across the bridges, down a slope, and over waterfalls of crashing mist, arriving at a beam of glowing dust. I flew into it and floated towards the peak, and there, my partner was waiting. A bright light and a soft breeze emitted from a great crack in the mountains peak, blowing a thin layer of snow past our feet. Our scarves crumbled away, and we walked towards the light. As we stepped into the blinding whiteness of our ultimate destiny, my partner chirped happily at me, as if to say “thank you”. And then Journey ended, and I sat before my television. I gripped my controller harder. Thoughts of the life that I had lived flooded into my consciousness. The teachers that I’ve had, the friends who have loved me, and the wise family that had watched over me and lovingly watched me step forward into every stage of my life. I thought of the bridges I had burned, the relationships that I had nuked, the lies that I’ve believed, and the ways I’ve hurt and hurt-ed. I thought of the path that I chose to arrive where I was, and my nascent purpose. Then I thought about my irreversible choice to live the life of a game designer. 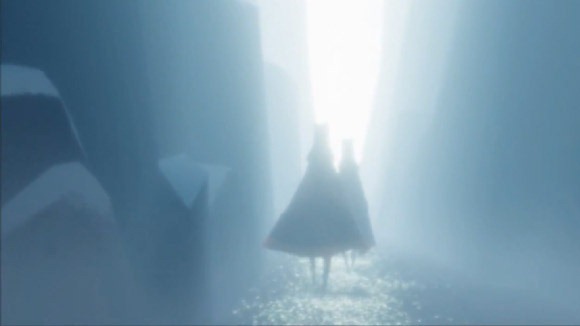 Journey was a game that had affected me unlike any other, touching me spiritually and giving me an cherishable experience. This is the power of video games! This is what I can potentially accomplish should I take this path! This is the kind of experience I could give to my players! This is what I want to do with my brief journey through the wilderness of life! I received a letter the very next week. It was an acceptance letter from a college that I wanted to go to: the USC Interactive Media Division, the most renowned game school in the world and the very same program from which Journey’s creators graduated. I nodded knowingly, accepting my destiny, and took those first steps towards that mountain looming on the horizon, ready to accept the company of any strangers I would meet along the way.